Let’s face it: airport food and beverage is overpriced and normally not that interesting (or even seemingly edible). Wine is no exception, with some wine bars and restaurants in terminals commanding a price for a glass of wine that is dangerously close to the bottle cost in a retailer. But with winter and holiday travels hovering, and many airport jaunts forthcoming as a result, we thought we’d put our heads together and narrow down the eight best places to sit down, relax, and sip a glass of wine…good wine…in an airport. In other words, if you have to lay over somewhere, these are the eight airports to do it. 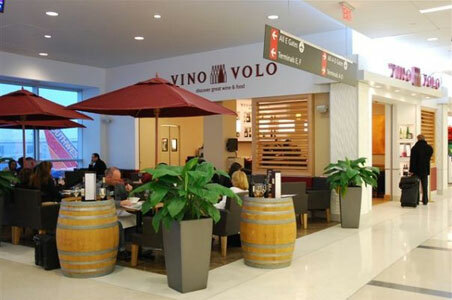 Then there is Vino Volo Wine Bar—in Italian, “vino volo” means “wine flight.” These wine bars are a breath of fresh air in many airports, offering an upscale wine-bar experience and boutique wine shop all in one, with a food menu too. For provisions, the menu is divided into suggested matches with white wines, red wines, and dessert wines, with the food prepared in two different-sized portions. Behind the Vino Volo concept is the founder of Ravenswood Winery, so you know it’s not just another food-or-beverage kiosk in the airport. Themed flights of two or three glasses each allow you to travel the world through your glass before hopping on your (other) flight. Insider’s Tip: Look for the “Sommelier Series” flight of wines, which spotlights two exceptional wines.